Rubblebucket is an indie-dance group whose energetic show performances are as noteworthy as their innovative compositions and mega-fun dance tunes. Their new album, Survival Sounds, came out this year. While on tour, frontwoman Kalmia Traver took the time to phone in from Seattle to talk about the new album , being on tour, and the flower creature thats appears on their latest cover art. Survival Sounds is such a great album. How did the creative development for this album differ from that of Omega La La and Save Charlie? Oh, thanks. Save Charlie was kind of the beginning of the creative development for Survival Sounds. We started writing for the record at the beginning of 2013 and we didn’t really have any time frame in mind. It was a lot of fun, we probably wrote 45 songs all together and we produced a few of those for the save Ch,arlie EP. That was testing the water. I was a really new and fresh experience writing in that sime, a lot of writing more deliberate. To describe it as one big process with Save Charlie and Survival Sounds , I kept using this metaphor that we’re planting little seed and little flowers spring up, like Save Charlie, and then the album was the full bouquet. The two founding members of Rubblebucket joined a reggae group upon graduation. Did that experience influence your approach to music in any way? Me and Alex are the bandleaders and we have five founding members; Alex and I went to University of Vermont where we met. It was pretty profound for me to experience life on the road. We’re all music students so we had a lot of training in classes and college but all of a sudden we were performing in fron big crowd and dealing with all these new kinds of elements. I learned about 200% more than I ever did in school. What were some things you learned? Well for one thing I learned about rock and roll history. I studied jazz in college, a lot of us studied jazz, and I grew up in Vermont where my family listened to a lot of Old time irish music. I listened to a lot of bebop and big band. I really got a much more broad musical education while on tour. Living together on the road and learning to collaborate was also pretty. I’m halfway between introvert and extrovert so collaboration is still a challenge for me. You have seven members, with such a relatively big band what’s the dynamic like? The core five are the ones who made the album together and then two are touring members. Alex wrote most of the songs and we didn’t have a system for collaboration. With each cook you add to the kitchen makes it more difficult to collaborate but the fact that the album was a success is something we’re really proud of. Together we have this big mumbo jumbo of ideas and influences. We’re four weeks of being on tour and it’s like this big universe of cosmic planets trying not to crash. What has the experience of being on tour been like for you? For the shows, well, this is more for me personally, but when you’re still up and coming you have to be thrifty with your time. We have five or six shows a week so I’ve been chanelling all my energy into the shows. I really love the chance to be in front of people who have listened to the music. That’s the biggest honor I could imagine, to have people come and pay to see your music live. I love the cover art for this album. Whose idea was that and how did it come about? So much of this album has to do with healing and perserverance but there’s also a dark edge to it. We were working with an artist who sent us that image. We get sent a lot of ideas for the cover art and when we got this we pounced on it. When we saw this image, this flower creature, it looked like this peaceful warrior that really personified what has gotten us through hard times in the past couple of years. We kind of created a mythology around it. To me it’s a symbol of love and healing and of a connection to the earth. I’ve had a lot of imagery go through my mind of being part of the earth which worked it way into things. Who or what would you say are some of your biggest musical influences? It’s hard to say because we have have such a diverse range of music that we love. Our forefathers, bands that have paved the way, include The Talking Heads, The Flaming Lips, Bjork. And we all love Michael Jackson and The Beatles. Oh man, I would love to sing with Duke Ellington sometime. Maybe that wouldn’t apply to everyone in the band but that would be a fantastic experience, to sing with the big band. I went to your live show and it was such a fun and beautiful time. How did you develop that aesthetic and those elements within the show? This show emerged from the subconscious a little bit. This show fits in with an the bigger set of ideas we’ve been working with. We’ve always loved incorporating visuals into our shows, interweaving visual and musical components. We also have the interactive element to the show, Break down the walls within live performances. Getting people out of their comfort zone. Yeah, you came into the crowd and danced amongst the people. It was great. That’s always been my favorite, dancing with the audience. We’ve always done that on tour. I think it freaks them out in a good way. Hey Everybody, which is our last song on Survival Sounds. I actually remember the first time we played it on tour, it was in Germany, in this really small town. There were about 40 people in this tiny bar and they weren’t really dancing but I could tell they were so focused. They were leaning forward when we played and I could feel this electric energy. It was almost like playing in a jazz club. 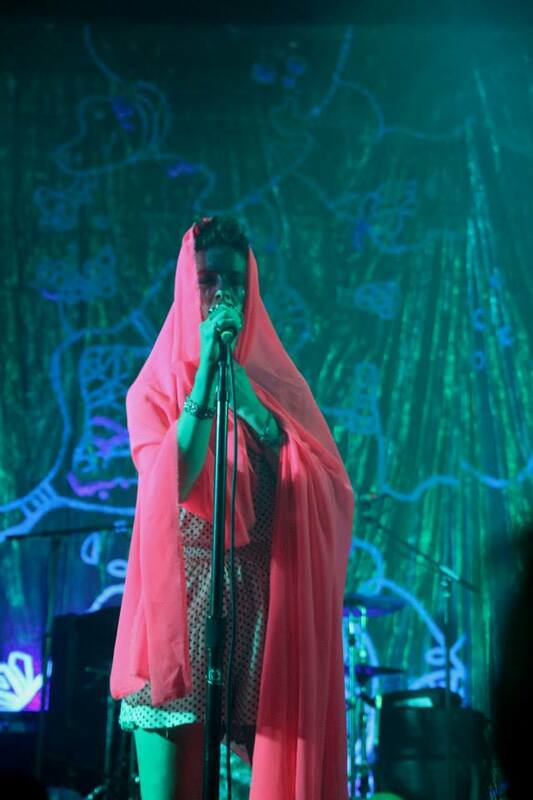 Check out our review of Rubblebucket’s live show. Learn more about Rubblebucket at www.rubblebucket.com. Charlotte Raskovich is a third year at University of Virginia, majoring in Media Studies with a concentration in Film. She is the Humor Editor of the Cavalier Daily and Co-Video Manager for the sketch comedy group, La Petite Teet.